Afrovibes – the biennial festival of live theatre, music, dance and visual arts from South Africa makes a welcome return to the UK with a four week programme of award-winning productions from October 13th to November 8th. 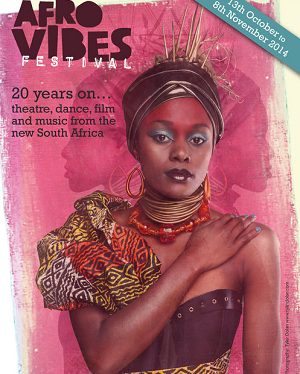 Marking 20 years of democracy in South Africa, Afrovibes is part of the official SA-UK Seasons 2014/15. Afrovibes kicks off this year’s 17-venue UK tour in London at the Albany in Deptford and at Stratford Circus from October 14th to 18th with a strong programme of drama, dance and music performed by artists from all over South Africa. Each venue will be hosting a pop-up Township Café – created by the local community - with food, drinks, late night music, DJs, workshops, poetry readings and much more. Afrovibes made its European debut in The Netherlands in 1999 and has since developed into a multi-disciplinary arts festival, which takes place in the UK and Holland. It presents the arts and culture from South Africa for the enjoyment of European audiences and artists, enabling them to engage with emerging talent and established African artists and their work. The first UK edition of Afrovibes took place in 2010 in London, Birmingham and Manchester; in 2012 dates were added in Cardiff, Nottingham, Liverpool, Lancaster and Hereford; this year Newcastle, Swansea, Bracknell, Edinburgh and Glasgow have also come on board. Afrovibes presents a programme of high quality contemporary South African theatre, music and dance, alongside a fringe programme of work by local artists. Providing a social meeting place is central to the festival ethos as demonstrated by the pop-up township cafes in all venues. With a truly South African flavour, the cafe becomes the hub of the festival in each venue, serving South African food, snacks and drinks. It hosts live music and debates, post-show talks, meet/greets with the artists and artistic exchanges.